Is this hydra, and if so what should I do about it? Is this a shrimp tank? I had hydra for a time I cut down on feeding and added a few assassin's. From what I understand pond snails are also partial to them. Thanks for the help and yes it’s a shrimp tank. I’ll go get some assassin snails. When you had it did the assassin snails fix it? For me yes, others say they pose a risk to the shrimp but I've never had any losses. Snails work great in a shrimp tank imo as they also remove an excess food. I could use some advice on this as well. Last night I discovered a host of little critters that look just like that in my newly established 10 gallon high tech experimental (haha) tank. I quickly googled to find out what they are and discovered they are hydra. I have been keeping low tech tanks for close to 15 years and never had them before. I have been doing a ton of research since last night and decided to either add something that will eat them or use some fenbendazole. Problem is, I am not feeding anything to the inhabitants of this tank, so I am not sure why I have so many. I started with only plants for 3 months, and then another month with plants and co2. Bladder shrimp invaded the tank, but I just let then be, thinking they would help the biological filtration process. Since I wasn't adding any fish food I thought their waste would help grow beneficial bacteria. Then string algae bloomed and I couldn't keep up with physical removal. (I am still.working on establishing a good balance of light, nutrients and co2. ) I added 5 amano shrimp and 5 short nosed algae eating shrimp about a month and a half ago. I ordered two Nerite snails, but they've only been in there a week, so they haven't helped a whole lot yet. The shrimp barely put a dent in the algae, so I went to the LFS last week thinking I would get get a juvie true Siamese algae eater temporarily, but the guy talked me into two American Flagfish. 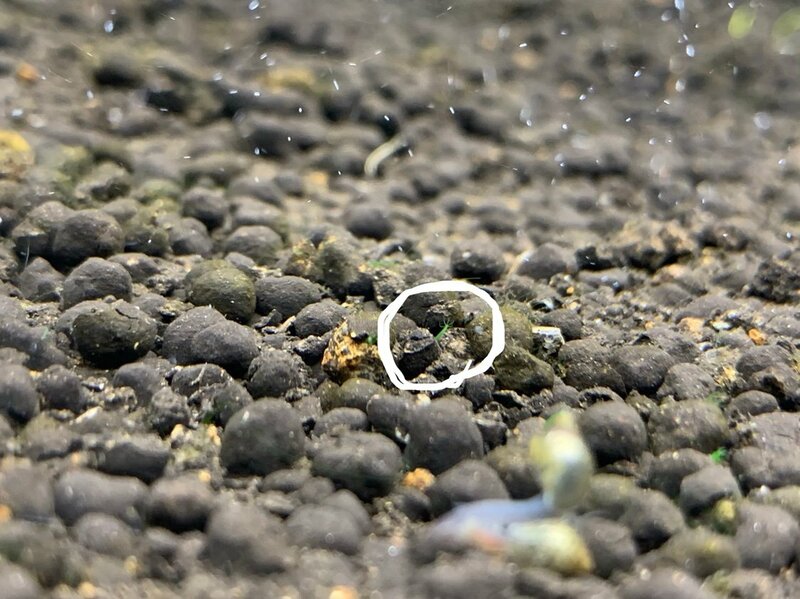 They are so shy that I rarely see them, but the few times they are visible I do catch them ripping at the algae. There is still so much string algae though. As I said, I am not feeding the tank yet so that everyone in there will eat the algae. I do weekly 50% water changes to reduce the oragnic waste accumulations from any decaying plant matter and the shrimp/snail and now fish waste. And now I am going to have to battle these hydra! Any ideas on why I have so many hydra? I was originally planning to move a group of Celestial Pearl Danios into this tank. Will they eat the hydra? I've read that they might, but wondered if any one has certain knowledge on this. (I would of course wait until the string algae is under control, and have returned the Flagfish to the store.) I will say though, they are quite fascinating, I almost hate to kill them off. If you don't feel like adding any more livestock to your tank, both fenbendazole and hydrogen peroxide are safe for your shrimp and will take care of the hydra. I just recently dealt with a huge explosion of hydra in my angel fry tank (fry are only 14 days old). I have always used fenbendazole, but it can be kind of a pain to divide it up into small enough portions. If you are wishing to use the fenben (it's effective, and extremely safe), I used a new methodology this time. I filled a water bottle with 500mL of water (~ 2 cups). Then I poured the entire 1g packet into the water bottle, and shaked hard until it was dissolved as best as I could get it. The typical dose ends up being .1g of Fenben per 10g, so with some simple math, it turns out to be 50mL of the cloudy mixture for a proper dose. I just used a medicine syringe and injected into the tank right over the hot spots of hydra. Approximately 12 hours later most were dead, and 24 hours later, all were dead. FWIW I didn't lose a single one of my angelfish fry. I've used it with dwarf shrimp in the past, as well, with no issues. I would not add assassin snails to a shrimp tank, they are known to take juvenile shrimp when they can. I've also not had much help from pond snails in my battles with Hydra, though I've also read that they will eat them. Your guaranteed fix has been previously mentioned - Fenbendazole. You'll want the aqueous suspension form, as it's not very water soluble. I've used Safe-Guard goat dewormer with excellent results. You dose .25 ml/10 gallons of water, let it stay in for 3 days, then do a large water change. Since you probably don't wish to do a large water change on your shrimp tank, be sure to add plenty of carbon to sponge up whatever medication remains after your smaller water change. You may find it elsewhere cheaper, but this is what I've used. No fussing with powders, just .25 ml/10 gallon. A 10 cc (1 cc = 1 ml) or smaller syringe works great, and you can purchase those on Amazon or get an "oral syringe" from local pharmacy if you don't already have one.